Although I’ve heard more than a few answers face-to-face, for the sake of this survey I asked for an email response to the question. My respondents were permitted to list as many as three people and I encouraged them to give brief explanations for their choices. The survey was not scientific and should be not thought to represent anything more than the answers of a mostly well-educated and not terribly diverse group of people I know. Many of them are close (including a few relatives), others more distant, and some can only be called acquaintances, friends of friends, or electronic correspondents. There were also a few surprising answers that I will get to in due course. Among those named in the Creative category were John Frusciante (former lead guitarist of the Red Hot Chili Peppers), Lucille Ball, Oscar Wilde, Jane Austen, Jim Carey, Patti Lupone, Anton Bruckner (19th century Austrian composer), Gustav Mahler (described as “the composer who fused sound and philosophy into the most soul-affecting music ever written”), Dave Matthews, Stephen King, Dr. Dennis Slamon (who helped develop the breast cancer drug Herceptin), and Barbara Walters. Respondents frequently expressed the desire to get inside the creative mind of their dinner companion and probe for practical guidance for their own career. One writer cleverly realized that a master chef would make the ideal dinner date, naming Auguste Escoffier, who is considered the father of modern French cuisine. I must also mention one brave soul (apparently unconcerned with losing his) who related that Satan would be first on his list of dinner invitations, so that he might ask the Prince of Darkness, “What happened between you and God?” When I told this to someone else, she thought that she’d probably already dined with and dated the devil more than once! Many people named Parents and Other Relatives as those with whom they would like to break bread. The reasons were often touching, as in the case of the woman who lost her father to an early death and her mother to the living-death of Alzheimer’s Disease. I’d love to have dinner with my paternal grandmother in her reportedly humble home in the rural Midwest. She, along with my grandfather and aunt, died in an accident before I was born. She was of a different ethnicity and is said to have been a beauty and a gentle woman. Her faded and torn, black and white, 16″ x 19″ wedding photo, dated 1901 (not wanted by any other descendants) sits under my desk waiting to be refurbished. I look into her dark innocent eyes and wonder about who she might have become, what her dreams were for her children and grandchildren, how she might have influenced my life, and why, as a ‘dishwater’ blond, I could not have inherited her black hair. If it were possible, I’d like to have dinner with my (miscarried) children. I’d apologize for never having the opportunity to meet them. Would they forgive me for not knowing my own body? For trusting my body to care for them… Would they understand that I wanted each of them more than anything? Would they see my anger at my own body? Would they be upset with how hard I blame myself? Would they see me struggling to find the answers? I’d want to know if I have their forgiveness and want them to know that I never stop wondering what they look like and who they could have grown up to be. … Would they have accepted us as parents? Would we have even be any good (as parents)? Some people wanted the chance to question mothers and fathers about the cruelty they experienced at their hands. A dinner with a deceased parent might also give the adult offspring a chance to inform mom or dad about that part of his life that they did not get to see. A friend of mine considered the possibility of contact with the 15-year-old version of her mom, wondering “what was she like as a teen?” And I’ve thought about what it would have been like to go to school with my folks. Would we have become friends? I find him a very interesting figure. I think many of us struggle from time-to-time in our lives with feelings of inferiority — that we don’t stack up well enough against those blessed with good looks or fantastic education or smooth speaking ability. Few people have struggled so publicly with these feelings (as Nixon) and I would want to know — in honesty — if he finally found a way through them and, if so, what that way was. That would hardly be the only thing we would discuss. I would want to talk (and have a nasty laugh) about his 1950 Senate campaign against Helen Gahagan Douglass, who he called ‘pink right down to her underwear’ (thereby alleging Communist or ‘Red’ sympathies). Were I to meet with Nixon myself, I’d also like to know how a man seemingly both introverted and cynical about people was able to take on the extroverted job of running for public office. Going from the anonymity of these women to the celebrity of a famous black baseball player, we come to the wish of an old buddy to spend time with Ernie Banks. Why (choose Ernie)? He’s been my hero my entire life. A superb athlete, quite obviously. However, here is a man from humble origins who, through the way he carried himself, made people forget that he was black. White or black he made people love him (but not White Sox fans), without the political baggage. Truly a credit to the human race. Which makes me think of how neat it might be to have dinner with Jackie Robinson, the man who broke baseball’s color line; or, indeed, any of the black major leaguers of the late 1940s and early 1950s. To be able to concentrate on the job of hitting or pitching a baseball while simultaneously being abused and threatened by your opponents, some of the fans, and even a few of your own teammates must take a special kind of courage and capacity for concentration. Is raw, unvarnished will a force that can be felt? I’d ask (Lombardi) about the nature of competitiveness — whether there are healthy and unhealthy varieties, for instance — and why it’s so important to win. The cheery assumption regarding dinners with revered persons is that the guests will publicly fulfill our projections of them. But having met nearly all the artists and musicians I admired, I can testify that almost none achieved that miracle. They were, after all, their own persons, ignorant of how I envisioned them and, in any case, under no responsibility to maintain an image consistent with what might be assumed from their achievements. Revealed more often, in varying degrees, was generalized courtesy, protective formality, shyness or inarticulateness. And in no instance did it seem that being thrown together with more strangers, however great or small, would suddenly cause the person to blossom, sharing previously withheld thoughts of a deep or scintillating nature. Some temperaments, of course, welcome opportunities to perform, drawing strength from situations that exhaust others. Presumably they would make better guests, though they tend to monologize rather than interact, dominating as if those around them were an audience instead of dinner companions. I responded to the challenge, but when Mahler arrived my courage sank. There was something so remote about him at first glance that I could scarcely imagine his taking part in any ordinary conversation. When we sat down to dinner he never even glanced at me. Oysters on the half-shell received his undivided attention. He did not seem quite so interested in the soup, however, so during that course I ventured a timid introductory remark. Without looking up he said ‘Ja,’ and then relapsed into silence. I racked my brains for a provocative subject of conversation, but nothing I could find in the animal, vegetable, or mineral kingdom elicited any response. Mrs. Steinway began to look distinctively triumphant. Finally, I remembered that before dinner, when Mahler appeared to be utterly oblivious of everybody present, he had taken The Brothers Karamazoff off the bookshelf and turned over the pages as though searching for a special passage. I decided that the Dostoyevsky masterpiece was this drowning woman’s last straw. But I also knew that if I did not succeed in establishing a controversial basis of conversation, I would merely get another ‘Ja.’ So I boldly asked him if he did not consider The Brothers Karamazoff a much-overrated book. ‘Not at all,’ said Mahler fiercely, putting down his knife and fork. ‘You ask that because you do not understand it.’ He thereupon launched into a long discourse on the subject of Russian psychology and Dostoyevsky’s supreme understanding of it, while I settled down to the enjoyment of my dinner (and my triumph! ), only throwing in an occasional provocative question when Mahler paused to eat a mouthful. The signals exchanged between me and the Steinways must have mystified anybody who saw them. Mr. Steinway kept looking at his watch and lifting his glass to me. He teased his wife unmercifully when Mahler followed me out into the drawing-room and spent the rest of the evening looking for passages in The Brothers Karamazoff with which to illustrate his points and complete my conversion. I have often wondered what would have happened if he had known we were discussing one of my favorite books. The counterpoint to dinner with a great man or woman is doubtless something simple. And, in the end, perhaps the question of choosing among the great personages of all time was the wrong question. Rather than some famous person from the past or present, who in all likelihood would have little interest in my company, I would like to have dinner with the ones who made me and are no longer with us, my mother and father, just to see them once again. Among the living, the one I would most like to have dinner with is the one I have dinner with every night, my wife. * Olga Samaroff-Stokowski, An American Musician’s Story (Norton, New York, 1939), 159 ff. 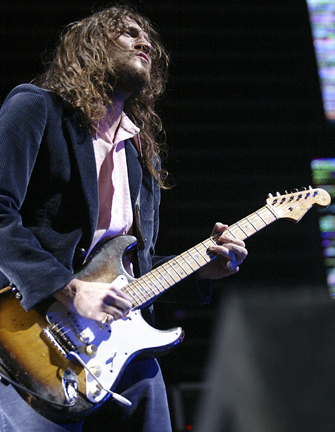 The top photo is of John Frusciante from a 2006 concert. 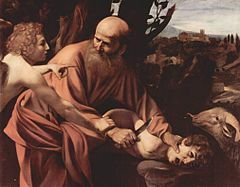 The second picture is a photo of Lucille Ball sourced from the Perplexed Historian, then Caravaggio’s The Sacrifice of Isaac (including a detail from that painting) dating from 1594-96. The next image is a 1952 presidential campaign poster on behalf of Adlai Stevenson II. 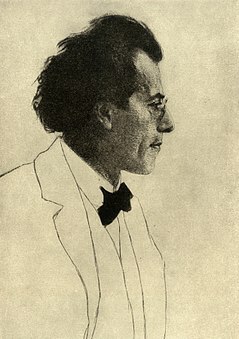 Emil Orlik’s 1903 etching of Gustav Mahler follows. 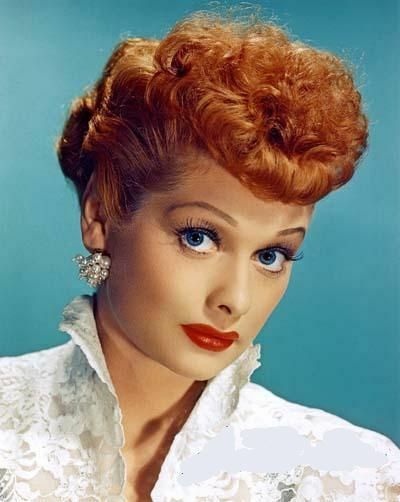 All are sourced from Wikimedia Commons with the exception of the Lucille Ball photo. ← Near Misses and Near Mrs.
What a wonderful treat to have read this. I had just arrived home from a painful, but non-threatening, surgery, so I didn’t participate. I can’t imagine any response I might have had being better than those offered. I, too, tend to give credence to picking a family member rather than someone with international fame. Although it’s wonderful to have teachers and role models, at the heart of life, it’s those closest to you that make the biggest difference. Thanks, Gayle. Glad to hear that the surgery is past you. I’m happy that you enjoyed the essay. I am always surprised by the responses I get in answer to questions like the one that prompted this post. Have a great holiday! Hi everyone, my name is clemtus and am from cyprus, I met this spell caster on templeoflove1 AT yahoo com online and so many other, but i decide to go with this particular spell caster and this is about 2weeks ago.I needed the spell caster to reunite me and my lover because she started behaving strange and a day came she text me and told me she cannot continue with the relationship anymore, that she just want to be alone.But a close friend of hers shows the guy to me that she was now dating.So i contacted this spell caster because i was totally heart broken and i smoked and get drunk till i could not even notice if am standing or lying.This spell caster tld me not to worry, he gave me hope that am to have her again just like old times, and i provided all the requirements, and in just 5days, laura called me crying over the phone asking for me to forgive her for her stupid act, and she swore with her mother grave to love me and never hurt me again.This was what the spell caster earlier told me and it came after he has done the spell and that same night, laura came to my house and spend the night with me.I have never seen spell as powerful as this but now, am convinced that templeoflove1 AT yahoo com is the best ever. Normally I don’t post spam comments such as the above. This one, however, is unintentionally very funny. Interesting question. I have always wanted to have a real conversation with – I bet you haven’t heard this one yet – Fred Rogers of Mr Rogers fame. That man was truly a good person and I would have enjoyed sitting in his presence. I wish I could have dinner again with a wonderful long time friend (my kids knew him as Uncle Franko although he was not related to them). He died unexpectedly about five years ago and I still miss him so much. I first met him in 1978 when he was teaching Environmental Studies at a local college. He was a warm, witty, and dedicated environmentalist who managed to make a huge impact on the world in his 70 years of being on the planet. And, yes, I would like to have a conversation with my parents. Both were good people, born in 1922 and survivors of The Great Depression and WW2 (my father a medic in the South Pacific). What is poignant to me is that neither of them really had access to the whole world of emotion and feeling. Or, at least, they were never able to show me that. They were hard workers who took what life gave them and made the best of it. I wish they each would have been able to talk more with us (they had nine children) but I think it is a function of their generation and their status as working class people. Interesting enough, however, every one of their nine children graduated from college (eight of the nine have advanced degrees of one sort or another) and,more importantly, each one is a kind and responsible human being. Clearly, they did something right. Thanks for adding to the richness of the responses to this question, JT. Your perspective on your parents seems unusually well balanced. I loved your essay & loved how imaginative you must be. However, I would chose to dine with William Shakespeare. I would enjoy my dinner & listen half heartedly to him speak & then as soon as I’d finished, I would stand up, walk to him & punch him in the face. I’d say…..’that’s for all the school children in this world who have been forced to read your works! My second choice would be my Grandfather who died when I was 6. Wow! Certainly the kind of dinner party no one else has thought of related to this blog. I guess those of us who still read him can be glad he predeceased the thought! Thanks for your compliment, Joanna. I’m glad you enjoyed the post. Cool question! This is so interesting, and I laughed at the spam reply. It’s hard to pick only one person because, as a psych major, I’d love to have dinner with Freud, Jung, Horney, and Poe. I’m a psychology major in her early 40s and planning to attend grad school later on. I love research and counseling, but I’m honestly afraid of the clinical training, since I’m still in treatment and waiting for a time when I feel more confident for grad school. Somehow I feel that a dinner with Freud, Jung, James, Horney, and Poe would help me in many ways. I’d get to see them psychoanalyze Poe; finally get the real answer to Poe’s death (and possible diagnosis); see Freud, Jung, James, and Horney debate on some psychological topics; laugh at their jokes or stories; and find some answers for myself (for personal healing, for research, and for future clinical practice). I’m tempted to tell my current therapist about this, just to see what she would say. In all honesty, I sometimes see the founding fathers and mothers of psychology in my mentor, some of my past professors, in my therapist, and even in a few of my former peers. But I also see the uniqueness of the neo-fathers and neo-mothers of psychology today when reading peer-reviewed articles, visiting webinars, reading blogs like this, or conversing with my mentor, therapist, and peers at times. This is such a neat question to ask! Thanks, Blake. The dinner might include some arguments, petty jealousies, attempts of one to “one-up” the other. Who knows? Of course, the Freud/Jung breakup is in the historical record. I like your idea of expanding the question to a group. I’ll have to think about that more.